The Chic Bargainista®: Labor Day Weekend Sales and Bargains! Labor Day Weekend Sales and Bargains! Looking for bargains this Labor Day Weekend? You are in the right place! Several great mark downs have come to my attention plus a great one stop shopping listing pf sales called Dealighted.com. 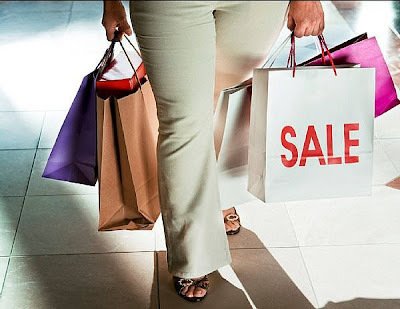 Dealighted.com lists the Labor Day sales from sites like Pottery Barn, Eddie Bauer, JC Penney, NY & Company plus websites like Speedo.com. What's unique about this sale listing is it also features coupons and links to user comments. I like this because you can see what other shoppers have already learned about the sale, sizes available and quality of the goods. Click here to see the reviews of the Eddie Bauer 70% off sale. Macy's has a variety of specials throughout the store and on their website. In their brick and mortar stores furniture and mattresses are discounted. If you buy online shoppers, you get an additional 25% off clearance items and free shipping code for orders over $99.00. There is also a $10.00 off denim deal at Macys.com. I have to check for my beloved DKNY Jeans to see if the discount applies! Nordstrom, the ultimate in shoe customer service is having a shoe sale. Here's the deal: Shoe Clearance - Save 33% or more on select shoes for women, men and kids at NORDSTROM. Ann Taylor Loft: Great Labor Day sale with Cotton T's as low as $6.99. I was in the Loft yesterday and was impressed by the selection. My top pick at Loft: the emebellished "petal" tee shirts, and tops with little ruffles at the neckline. Gap: I stopped in our local store yesterday and saw the bright signs declaring "Buy 3 Items get 25% off." I liked their selection of ballet flats, ruffled shirts and jeans. Loehmann's Final Clearance: Amazing markdowns. Some items are only $5.00. This is primo Recessionista shopping! Kohl's : 30-50% Off Entire Stock Simply Vera Vera Wang Collection and more, check Elle, Dana and Apt. 9 deals. Barnes & Noble: Beatles Remastered CDs and Beatles for Rock Band. Plus, Save an additional 10% off one item with coupon code: P8T3T73. My book pick, is the new Ted Kennedy memoir. I'll be using my coupon on True Compass. And finally, a "Freebie Alert": Stop by Chick-fil-A on Monday while wearing your favorite sports team's logo and pick up a free chicken sandwich. If you're reading from outside the US, look for deals on sites like Overstock.com and Amazon.com which ship internationally. In store, check out H&M, Zara and New Look clearance racks. Look for the final clearance Giles Deacon Gold items at New Look. I'll be updating my "Top Picks" on the Right Nav bar for designer deals throughout the Labor Day weekend. If you find great deals, please drop me a note or send a comment. Share the savings with all The Recessionista's Readers!